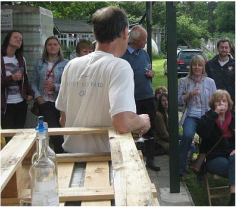 Wine societies, companies organizing away days, social clubs and friends celebrating birthdays or hen parties are just some of the types of people that come to Bothy Vineyard for tours. The typical tour starts off with a gentle walk around the vineyard during which we talk about the history of the vineyard, the economics of such a modest business, viticulture and the environmental factors which affect our harvest and wine. The ground is fairly flat around the vineyard and there is disabled access to the winery. Then the party is taken to the winery where wine-making operations are explained. Finally we provide a free tasting of our award-winning wines with a few nibbles, most probably cheese and biscuits. This takes around 2 hrs depending on the interests of the group. We provide tours for groups of 12 or more, but can only accommodate up to 30 persons. Tour prices start from £10 per head - please contact us for more information. Please note that such tours are not exclusive as groups may be joined by other customers, unless specifically requested. We always ask that the organiser collects the money. The tour season runs from 2019 May to September. Our tours have been exceedingly well received over the years. View comments on Bothy Vineyard on Trip Advisor. and read our testimonials. To discuss charges and details on tours please ring 01865 390067 or email office@bothyvineyard.co.uk. It is ESSENTIAL TO BOOK. The shop - We have ceased regular opening times but we still welcome sales by appointment. Please ring 01865 390067 to arrange a purchase. We will be re-opening on Saturday 27 April and every Saturday from then on till the end of September. Opening hours will be 11 am - 6 pm. "You really did give the Berkshire Wine and Food Society a super day. The best guided vineyard tour I’ve ever had and, as you can imagine, I’ve been on quite a few". Rover Evoque Launch at Bothy with marquee and new car models on display. Bothy Vineyard is available to hire for events (not weddings). Please contact us for more details. Bothy is just six miles out of Oxford, near Abingdon, with easy access from the A420 (Oxford - Swindon road) as well as the A34. There is ample parking space and flat open spaces in between the vines. NB We do not provide talks outside the vineyard, except under exceptional circumstances. We regret we are unable to cater for weddings. No car? You can catch a bus to Bothy now. Visit our contact us page for more details.